The gold Classic Commemorative series is a short, but challenging set. 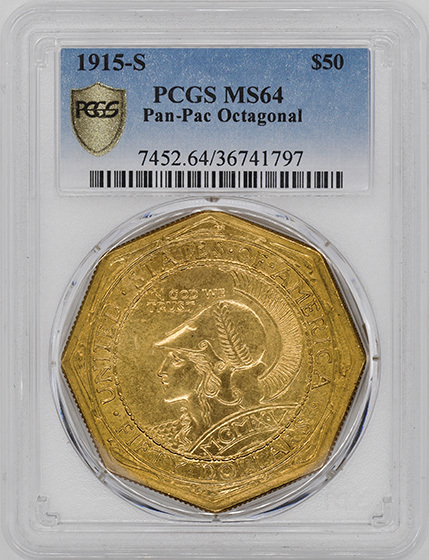 There are 13 different issues, but two—the Round and Octagonal Panama-Pacific fifty dollars—are rare and valuable. 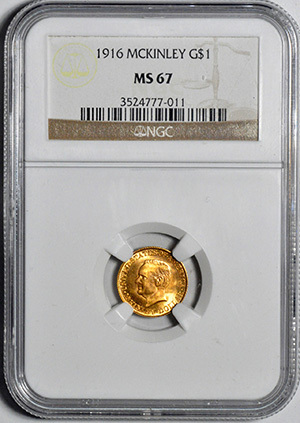 High grade examples of all early gold commemoratives are elusive and very desirable. The first United States gold commemoratives were issued in 1903 for the Louisiana Purchase Exposition, held the following year. Two varieties were struck: one with a bust of Thomas Jefferson, president at the time of the Louisiana Purchase, the other with William McKinley, the president who approved the exposition. 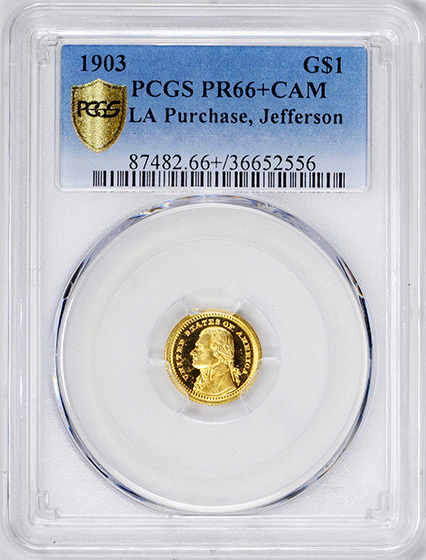 A mintage of up to 250,000 gold dollars was authorized, but at $3 a piece the number sold was far lower. Each issue had a final distribution of 17,500 examples, and in 1914 the remaining lot of 214,000 coins was melted. Although the 1903 Louisiana Purchase Exposition coins were a mixed success, another commemorative gold dollar was issued in 1904 and 1905 for the Lewis and Clark Exposition held in Portland, Oregon. These coins had the same authorized mintage as the 1903 gold dollars, but the distribution was even lower—approximately 10,000 each for the 1904 and 1905. Undoubtedly the most famous gold commemoratives are those issued for the 1915 Panama-Pacific Exposition, which was held in San Francisco to celebrate the completion of the Panama Canal the previous year. Congress authorized a silver half dollar and four gold pieces: a one dollar, a quarter eagle, an octagonal fifty dollar, and a round fifty dollar. 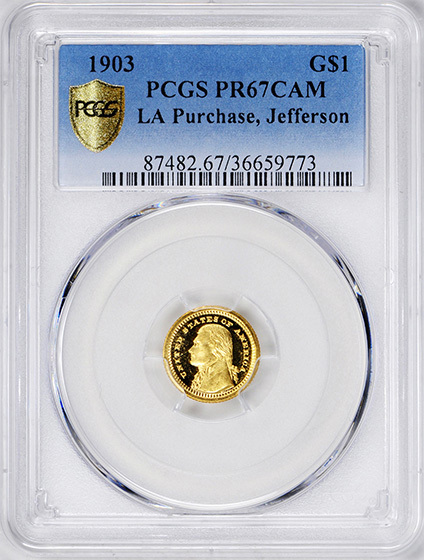 The two fifty dollar gold pieces are the largest coins ever issued by the United States and are highly prized today. The next gold commemoratives were dollars issued in 1916 and 1917 to help pay for the McKinley Memorial in his birthplace of Niles, Ohio. 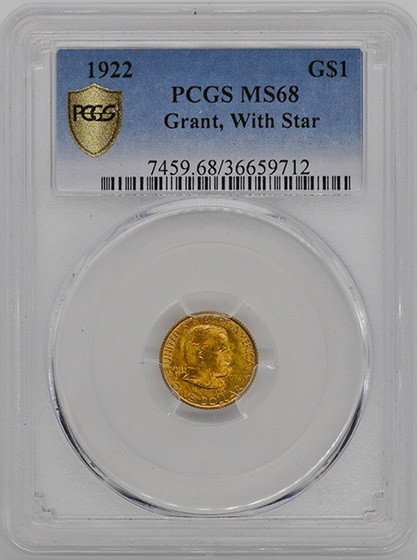 Another gold dollar was issued in 1922 for the Grant Memorial. 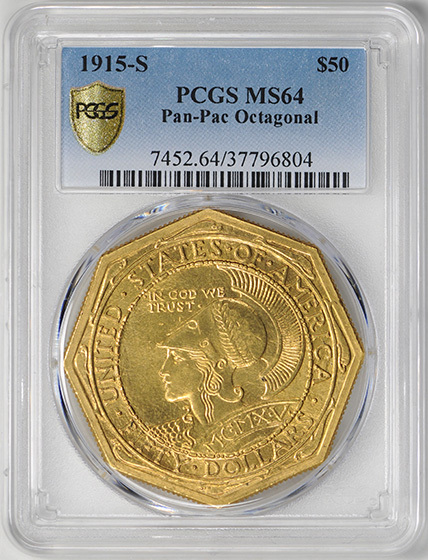 The final gold Classic Commemorative was struck in 1926—a quarter eagle to celebrate the sesquicentennial of the Declaration of Independence. In all, 13 different gold commemoratives, including varieties, were issued as part of the Classic Commemorative series. Nine of these are gold dollars, two are quarter eagles, and two are fifty dollars. Distributions range from a low of 483 pieces (1915-S Round Fifty Dollar) to a high of 46,016 (1926 Sesquicentennial $2.50). While many of these, save for the two fifty dollars, can be easily collected in low grades, most are very rare in Gem and higher grades. The two fifty dollars are usually not collected because of price, and many collectors try to complete an 11 coin gold Classic Commemorative set. GEM FLASHY CAMEO. ONLY 100 STRUCK. TIED WITH ONE OTHER FOR HIGHEST GRADED. GEM CAMEO PROOF. ONLY 100 STRUCK. JUST 2 GRADED HIGHER AT PCGS. GRANT WITH STAR. TIED WITH 4 OTHERS FOR HIGHEST GRADED AT PCGS.